I'm a bit late with my post tonight. We've been out for dinner with friends and just got home so right now I can't really think of the words I need to get this post up! Less waffle, more nails. 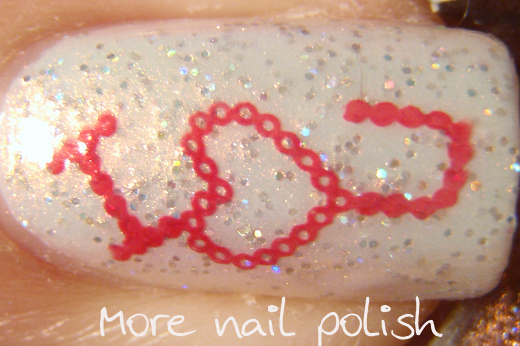 Here is the mani I did last night. I used Glitter Gal Copper, which is such an amazing warm peachy pink holo with a feature nail of Glitter Gal White Sparkle. I then stamped some white hearts on each finger from a Bundle Monster plate and stamped the I ❤ U in red also from a Bundle Monster plate. 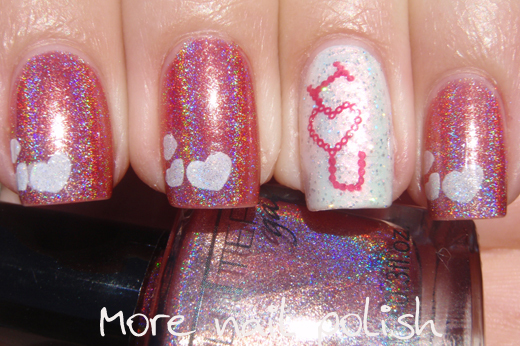 Because I felt the white hearts stood out a bit too much on the beautiful holo, I put a tiny bit of spectraflair top coat over the hearts to make them holo and to match the background of Glitter Gal Copper. Of course this morning it was so horribly overcast and the most terrible lighting for holos. This was the best I could do beside the back door. Because I wanted to capture the amazing holo in Glitter Gal Copper, I went into the bathroom and took this photo under the heat lamps. The white balance still isn't great, but I'm not looking like too much of an oompa loompa. Low and behold, this afternoon the clouds parted and there was sunshine! 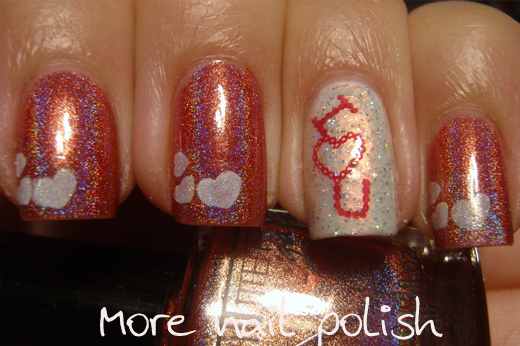 Yes, I could finally see this mani it all it's beautiful holo goodness. I'm not sure, but I thought Glitter Gal Copper might be dupy of Ozotic 522, but now I'm not completely sure. Ladies, I will do a comparison swatch so we can check that out. Maybe I'll post that at the same time as White Sparkle over black. 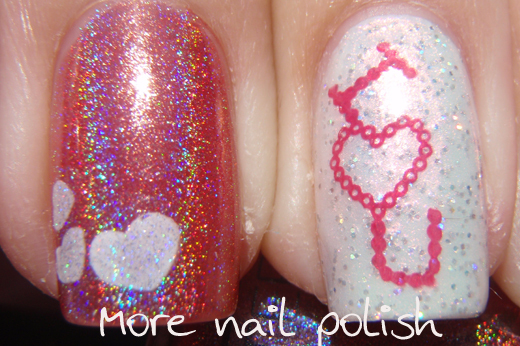 I'm super happy with how this Valentines mani turned out, it was very pretty and girly and the two Glitter Gal polishes complimented each other perfectly for this. 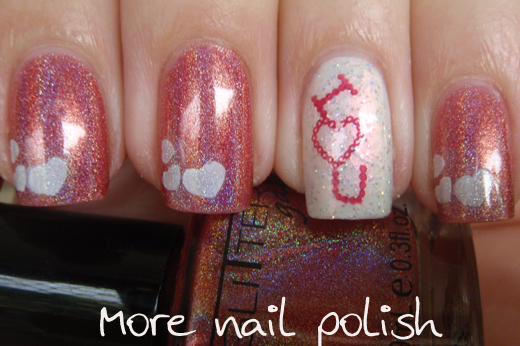 Love this mani, the colours go so well together - I even like the I <3 U stamp and I'm not even one to like words on my nails. I might have to cave and get bundle monster plates afterall. The Glitter Gal Copper is a beautiful shade and the whole coordinated effect is just stunning. So perfect for Vday! Love it! So beautiful! 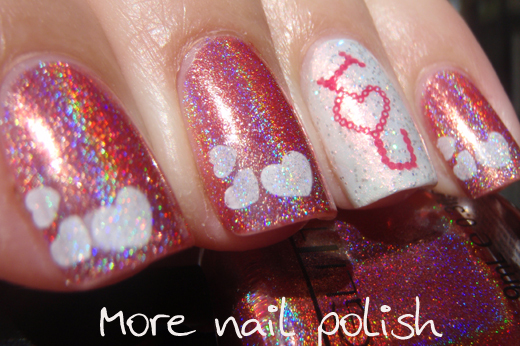 Love Glitter Gal. What plate did you use for that accent finger-that says I heart U??? Love it. I really need to make a holo top coat soon!